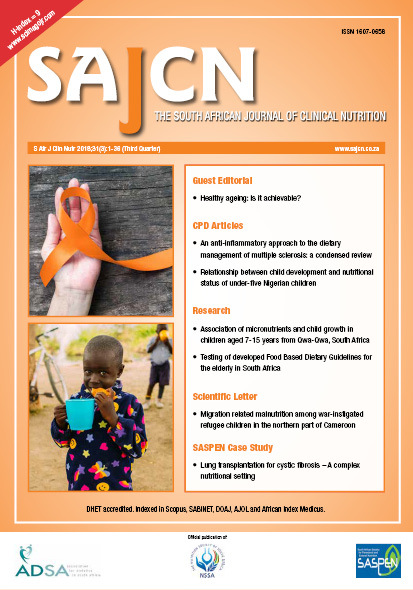 Objectives: This study investigated the possible associations between micronutrient deficiencies and child growth in the rural community of Qwa-Qwa in the Free State province of South Africa (SA). Design: Cross-sectional observational baseline survey. Setting: Rural Qwa-Qwa, Free State, SA. Subjects: Children 7- 15 years of age (n = 73; randomly selected). Outcome Measures: Nutritional status in terms of height and weight measurements, and serum haemoglobin, vitamins A and E and zinc. Results and conclusions: The results of this study showed that there was no significant difference between the mean age of the two genders (p = 0.94). The prevalence of micronutrient deficiencies were 47.3% vitamin E, 25.0% zinc, 3.9% haemoglobin and 1.4% vitamin A. The prevalence of wasting, stunting and underweight was 19.2, 13.7 and 11.4%, respectively. Linear regression analysis showed statistically significant positive correlations between weight-for-age (WAZ) and haemoglobin (r = 0.38, p = 0.049), zinc (r = 0.71, p = 0.008) and vitamin E (r = 0.43, p = 0.029) levels, while there were no significant correlations between vitamin A with WAZ, height-for-age (HAZ) and body mass index-(BMI)-for-age (BAZ). This study shows that there are some associations between child growth and certain micronutrient deficiencies that affects the growth and well-being. Therefore, regular and continued monitoring is recommended for the benefit of, specifically South African children, but also the general population, researchers and the government.